China says bilateral relations with South Korea is one of the most important partnerships in Asia and the Pacific region. Chinese premier Li Keqiang on Wednesday met with South Korea’s foreign minister Yun Byung-se. Referring to the recent strain in relations between North and South Korea, Li asserted that China would like to work with South Korea to diffuse tensions. China has also reaffirmed its commitment to the denuclearisation of the Korean Peninsula and opposes any instability in the region, Li urged. 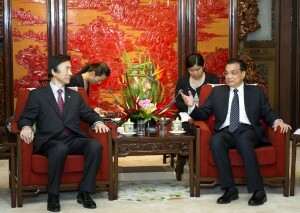 Li called for the two countries to deepen pragmatic cooperation, and speed up free trade area negotiations. A top US military officer has said on Wednesday that he believes China is trying to diffuse tensions in the region. “I will leave here with the belief that the Chinese leadership is as concerned as we are with North Korea’s march toward nuclearization and ballistic missile technology, and they have given us an assurance that they are working on it, as we are,” US chairman of the joint chiefs of staff general Martin Dempsey told reporters on the last day of a trip to China. Yun also carried South Korea’s condolences to Chinese families that have been devastated by the recent earthquake in southwest China’s Sichuan Province. South Korea also announced that they will give $1 million to China to aid earthquake efforts. Yun said South Korean President Park Geun-hye and the new cabinet place great importance on ties with China. Yun is visiting Beijing at the invitation of Chinese foreign minister Wang Yi.